Review: This book is a GREAT story. I know many of you struggle with "demon" books and such because of religion. I am a very religious person, however, when I read books like this I don't see the "demons" as actual demons. I just see them as any other paranormal creature. And in this regard the story was awesome. It was original, gripping, and well written. The romance in the book bugged me (I just had a hard time connecting with the love interests), but it wasn't at the forefront of the story. This story was about Riley and the things she went through, and that included her relationships, but was not dominated by it. I also really wished that MORE had happened. I felt that this book didn't cover a lot of ground. I wanted more excitement, more big reveals! What I got was a lot of exposition. If I was rating the book on story alone, I probably would have given it 4.5 stars. I'm sure that the next books in the series will cover all the things I felt lacked in this book. Unfortunately, I will not be reading the rest of the series. 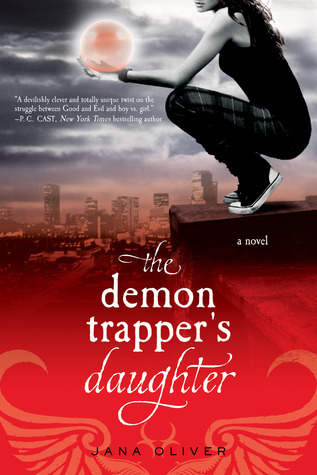 Even taking the demon's out of the equation, The Demon Trapper's Daughter was a very harsh read. I was worried about this before reading so I asked some people how severe the profanity was, and was told by numerous people that it wasn't very bad. This is always a dangerous question, because I know profanity doesn't bother most people like it bugs me. There was a lot of profanity in this book. Just about every curse-word you can think of (frequent uses of the f* word). However, I continued to read it because the MC herself actually had a fairy clean vocabulary. Unfortunately, only about 70% of the book is told from her point of view. And nearly all people she interacts with are very crass. This is what brought my rating down to 2.5 flowers. And so, the awesome story and main character was enough to make me finish this book, but the profanity was just too intense for me to read the rest of the series. I hope someone I know will read them, though, so that I can ask them what happens. If profanity/demons don't bug you, then you should read this. It's a purty good story. Apologies for two negative reviews in a row. tomorrow I'll be posting an UBER-positive review! So look forward to it! Hmm. I wondered about this one. But I might wait on it now. Thanks for the heads up. Unfortunately, both profanity and demons bug me, so I probably won't be reading this. Profanity doesn't bother me too much as long as it's not over-the-top. Strangely, it's the multiple love interests that turn me off. I am beyond sick & tired of love triangles...and I think it's even more ridiculous when the protagonist is being pursued by or is attracted to 3 or even 4 guys at a time. Though profanity doesn't bother me, I didn't excepting that coming. Glad to know that it has a story line.